Well today just happens to be the 76th birthday of Roger Hargreaves, the British author who created the Mr Men and Little Miss children’s books that are enjoyed by many youngsters the world over. So to mark the occasion we thought we’d bring you a Little Miss app for your iOS device. Yorkshire born Roger Hargreaves’ first drawn Mister Men character was Mister Tickle, and at the time of his death in 1988, Hargreaves had sold roughly 85 million books in 15 languages, and after his father’s passing, son Adam has continued writing and illustrating the Mister Men and Little Miss books. 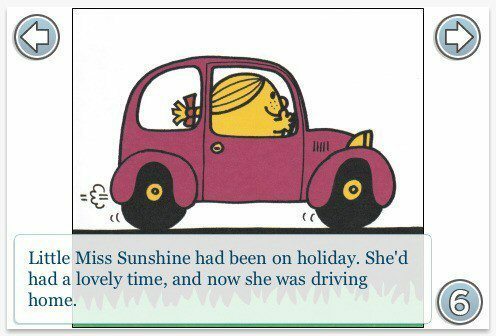 The app we have for your consideration today if the Little Miss Sunshine app for iOS devices and features such things as the ability to make your own audio book with your own voice, progressive page flow, the ability to jump back and forth to your favourite part of the story, pinch and zoom on images, and tapping the audio button has the story read out aloud. The Little Miss Sunshine app for the iPhone, iPod Touch and Apple iPad running iOS 3.0 or above can be downloaded to your chosen iOS device from iTunes at a cost of $1.99.